The Cupcake & Crossbones is our signature dessert over here in these parts. It is dangerously delicious and although it may be one of our least "healthiest" recipes on this blog, you will be happy that we shared it. Treating yourself to one of these bad boys or splitting it with someone worthy of tasting something so delicious will have you knowing that yes.....this is heaven in a jar. -Once you are ready to devour your jar of goodness, scoop a nice big spoon of ice cream on top of your cookie. -Spray some whipped cream on that bad boy. 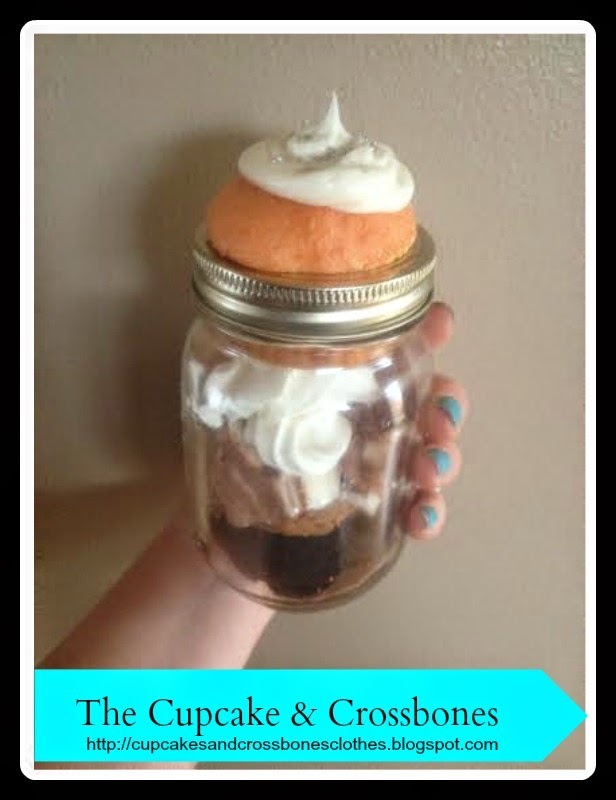 If you have some extra time to spare, follow the recipe for the cupcakes, brownies, and frosting like so. 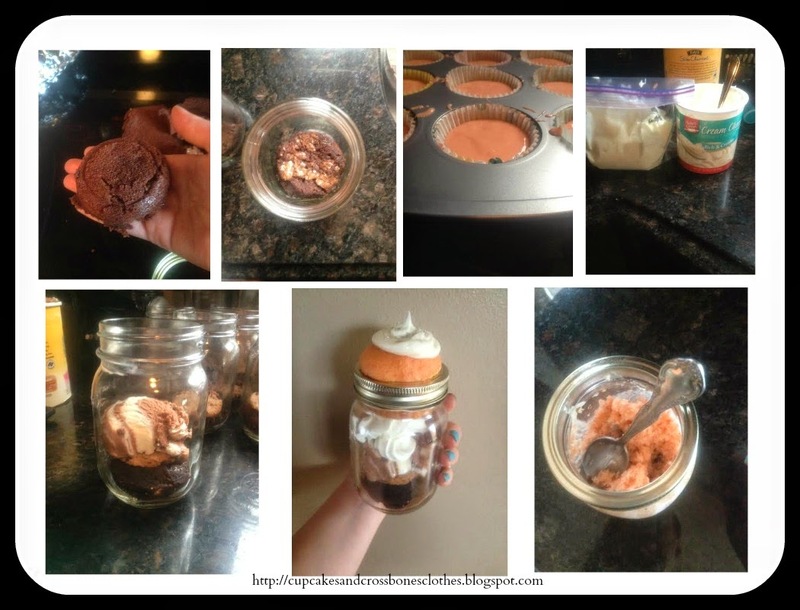 -Preheat oven to 350 degrees F. Put baking cups in your cupcake pan. Sift together the flour, baking powder and baking soda. Set aside. -In a large bowl, cream together the butter and sugar. Beat the eggs and then stir in the vanilla. Beat in the flour mixture with the buttermilk. Pour batter into prepared baking cups. -Bake in the preheated oven for 35 minutes, or until a toothpick inserted into the center of the cake and it comes out clean. -Preheat oven to 350 degrees F. Spray cooking spray on your pan. Set aside. -Use a medium sized saucepan over medium-high heat and melt the butter. -Add sugar and vanilla. Stir well. -Remove pan from heat and usa a whisk to stir in the cocoa powder. -In a separate bowl beat the eggs. -Pour batter into your sprayed baking pan. Bake at 350 degrees F for 30-40 minutes. With an electric mixer, mix the butter and cream cheese together on medium speed until smooth. Keep adding until you get your ideal sweetness and thickness. 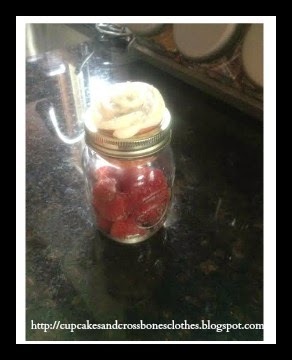 -Put strawberries in your jar and top the jar with an angel food cupcake with whipped cream. What do you think? Heaven in a jar? Oh my goodness, that looks heavenly.